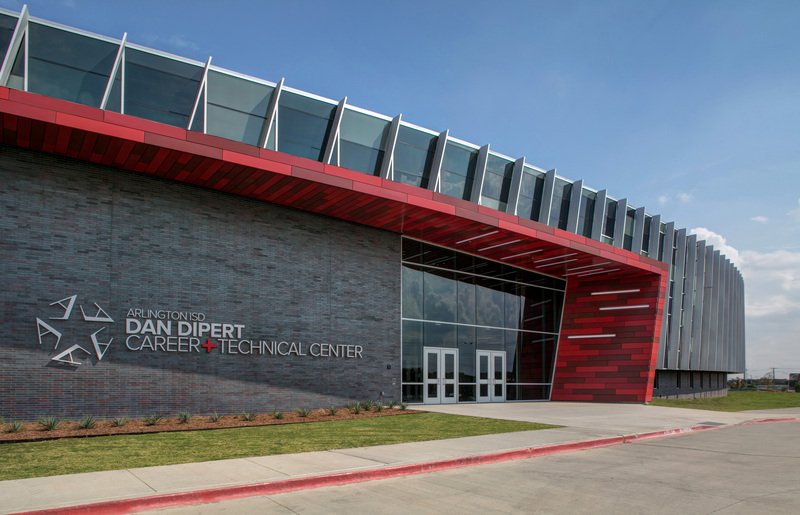 Celebrating the beginning of its second academic year, the Dan Dipert Career + Technical Center (CTC) serves approximately 2,400 students from across the Arlington Independent School District (AISD) in Texas. 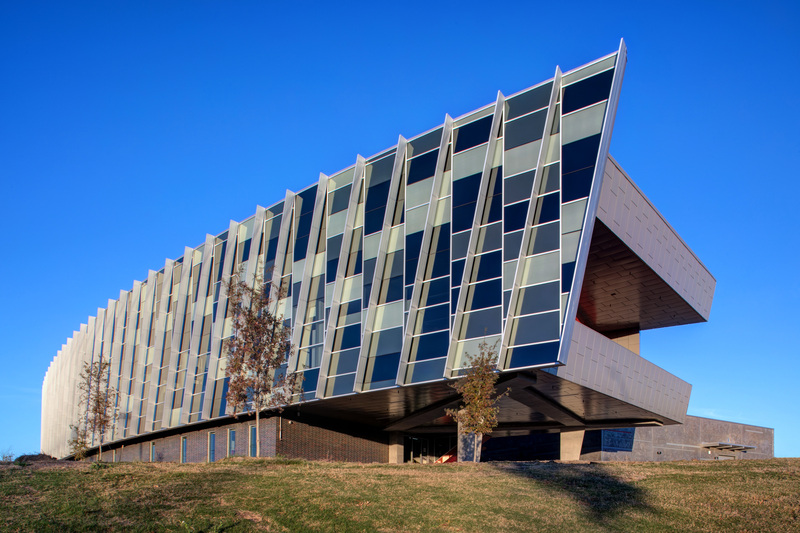 Designed by VLK Architects, the CTC incorporates Tubelite Inc.'s storefront, curtainwall, entrances and sun shades – on both the building's exterior and interior – emphasizing transparency to promote collaboration and connection. 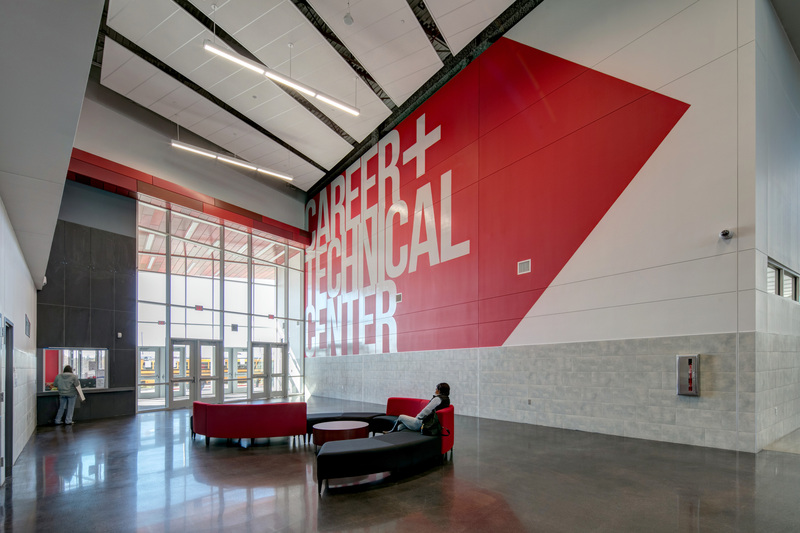 Providing real world experiences and skills for high school juniors and seniors, the CTC's purpose-built, two-story structure spans 169,800 square feet to accommodate Career Technical Education programs in 18 specialized academies ranging from culinary arts to robotics. The facility is designed for flexibility to evolve and adapt to changing programs and future areas of interests. "Collaboration at all levels is the driving force behind the design," described VLK Architects Project Designer Richard Hunt, AIA, LEED® AP. "Expressive and monumental, the architecture is unique to the neighborhood and city as a whole. The expansive curtainwall, featuring diagonal sun shade fins, serves as a subconscious billboard to passersby – visitors and students understand they are entering an institution of higher learning and not just another run-of-the-mill high school building." Tubelite worked closely with VLK Architects and glazing contractor Pierce Riverside Glass to achieve the CTC's architectural vision and meet the project's performance requirements. Tubelite's Wide Stile Entrances employ durable tie-rod corner construction to withstand continuous use from students, staff and visitors. Enhancing the façade's strength and thermal performance, the Wide Stile Entrances are installed within Tubelite's T14000 Storefront Framing system. T14000 Storefront is flush-glazed system ideally suited for low-rise applications. Also suited for the Texas heat, the CTC's storefront and curtainwall systems uses Solarban® 60 Solar Control glass. This high-performance low-e glass blocks unwanted solar heat and allows in visible light for year-round comfort, as well as heating and cooling cost savings. Further minimizing costs and maintenance, the clear anodize finish on all of Tubelite's aluminum systems for the CTC meets the American Architectural Manufacturers Association's AAMA 611 specification. Applied by Linetec, anodize protects the structural integrity of the aluminum for lasting durability. In total, Linetec finished nearly 75,000 feet of Tubelite's extruded aluminum framing systems. Pierce Riverside installed every inch of material from Tubelite, including the 400 Series Curtainwall and custom MaxBlock® sun shades define the CTC's building envelope. Kevin Haynes, Tubelite's architectural specification manager, elaborated, "We worked on this project from conception with VLK and engineered a custom 24-inch vertical sun shade detail that runs the length of the of the 9-inch-deep curtainwall. Not only is the sun shade custom, but is on a slant connecting at the bottom of one vertical curtainwall mull and carries across to the top of the next vertical curtainwall mull." Tubelite used its 3-D printer to create various sizes and thicknesses of the sun shade detail. "Having the 3-D printed prototypes saves a lot of money and time. These samples let the architect see something and determine the right look before committing to the expense of a bunch of new dies," said Dan Smith, Tubelite's client development manager. "Because of all the upfront work Tubelite's engineering team did, Tubelite was the basis-of-design for the project." Inside the CTC, VLK Architect's specified Tubelite's INT45 Interior Flush Glaze Framing system. The system's perimeter trim members were pre-applied on one side of the frame opening for fast, simple installation by Pierce Riverside. "All 18 academies surround a central space fronted with glass to maximize transparency," observed VLK's Hunt. "Strolling down this main corridor, one can view students engaging in a variety of skills, from aligning the wheels on a Ford F150 or programming and operating CNC machines, to students styling hair or conducting TV Newscasts." VLK Architects extended the CTC's signature look to create all-inclusive, branded facility. 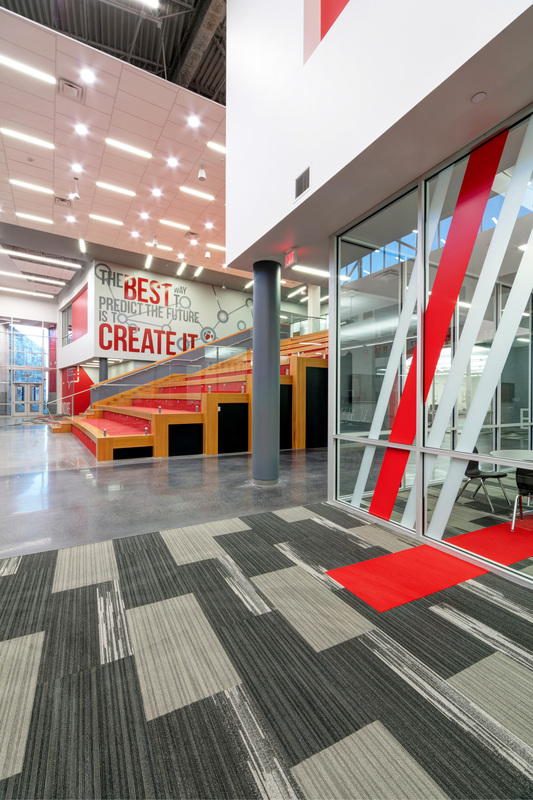 Hunt explained, "The brand for the program and the building had to be united, easily recognizable, simple and powerful, symbolizing the opportunities the Center affords students in this large district. It was inspired by the building itself, using the (Tubelite) sun shade fins as the repeating image throughout. He added, "The image not only works to identify the school, but also provides wayfinding so that academies can be easily located. ...Visitors and students can easily identify the Dan Dipert CTC and will remember it long after they experience it." Located on the former site of Hutcheson Junior High, the CTC's districtwide facility was funded as part of the AISD's $663.1 million bond program approved by voters in 2014. Construction manager Balfour Betty US broke ground in April 2016 and completed the project on schedule for its opening in August 2017. A dedication ceremony followed in February 2018. At the dedication event, VLK Architects Partner Sloan Harris, AIA, NCARB, LEED AP, stated, "This project is an incredible accomplishment for Arlington ISD. The Center is second to none in the state and will be a tremendous benefit to the AISD students for decades to come. The Center not only represents the educational leadership and innovation that AISD provides, it is symbolic of the diversity and global business leadership of the Arlington community. We are very proud to have been a partner with Arlington ISD in bringing their visions to life."